Rap is poetry with emotion. But you don’t need to know the genre or the legacy of rap music to get into the vibe of Gully Boy. Zoya Akhtar creates a universe that transcends the limits and brackets of what is normal, giving the story of Murad (Ranveer Singh) and his belief in ‘apna time aayega’ a universal appeal. Gully Boy is set against the backdrop of the underground rap scene in Mumbai where every child who can spit lyrics and write bars dreams to one day make his passion his profession. But Gully Boy isn’t just the story of rap, it is also the tale of a mother and son, of love that is possessive and dreams that can’t be caged. Set in Mumbai’s Dharavi slums, Gully Boy narrates the ascent of Murad to the top. His journey is not just limited to his rise as a rap star but also encompasses his personal strife with his abusive father (Vijay Raaz) and an over possessive girlfriend Safeena (Alia Bhatt). Then there is Murad’s sidekick who actually teaches him the craft - Sher (Siddhant Chaturvedi) and plays a very important role in his journey. Gully Boy is definitely a landmark film that will shine bright on Ranveer and Alia’s eclectic resumes. This is also Zoya’s best work till date and a film that will resonate with anyone who believes in dreams and their manifestation. Total Dhamaal is a series of unfortunate events which will pack in a weekend of laughs. After Dhamaal and Double Dhamaal, the franchise returns to the big screen with Total Dhamaal. The movie features Ajay Devgn, Madhuri Dixit and Anil Kapoor who join Arshad Warsi, Riteish Deshmukh, Javed Jaffrey and Sanjay Mishra in lead roles. The movie's trailer had promised a mad ride and we're here to let you know if it's worth spending your money on this one or not. Without further ado, here is BollywoodLife's review of Total Dhamaal. After an emotional weekend with Gully Boy, Total Dhamaal is here to tickle your funny bones without using much brains. Set in Chambal in the 1970s, Sonchiriya is the tale of Sardar Maan Singh (Manoj Bajpayee) and his gang. They are a team of God-fearing Baaghis (rebels) who believe in their dharma. But what exactly is that dharma is a question that causes immense mental and emotional turmoil to all. The film directed by Abhishek Chaubey stars Sushant Singh Rajput and Bhumi Pednekar in lead roles. The ensemble has some powerhouse performers like Ashutosh Rana, Manoj Bajpayee and Ranvir Shorey. Sonchiriya means a beautiful mythical bird that is evasive and for these Baaghis, it is their personal redemption. Find out if you should book your tickets for this Kartik Aaryan and Kriti Sanon starrer here! After delivering one of his career-best in Sonu Ke Titu Ki Sweety, Kartik Aaryan is back with another wholesome entertainer with Kriti Sanon - Luka Chuppi! The film also stars a talented bunch of actors like Aparshakti Khurrana, Pankaj Tripathi and Vinay Pathak. Now, while the trailer packed a few punches and went on to garner all the laughs, we are here to let you know if it's worth spending your money on this one or not. Without further ado, here is BollywoodLife's review of Luka Chuppi. Watch it for Kartik Aaryan and Kriti Sanon's refreshing chemistry and Pankaj Tripathi's antics in a one-time experience (if you have absolutely nothing else to do). We are going with 2 stars. The opening credits of Sujoy Ghosh's Badla took me back to the days when I was obsessed with Agatha Christie's telly adaptation of Hercule Poirot. While Sujoy might not have Senior Bachchan flaunt a twirled moustache in Badla, there is no denying the homage he's paying to the thriller genre. 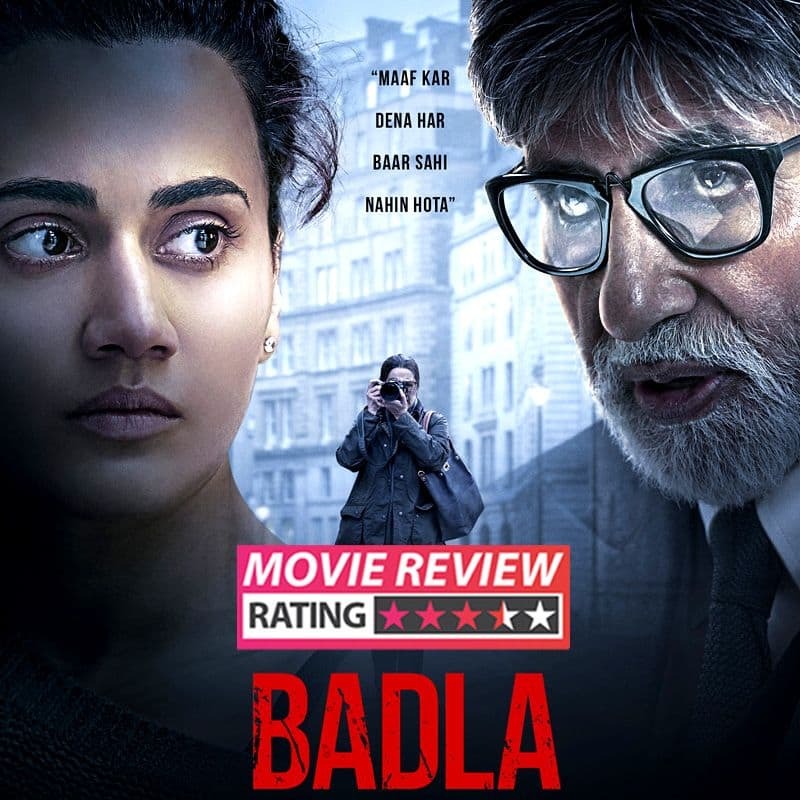 Badla is a remake of the 2016 Spanish thriller The Invisible Guest and whether you have seen the original or not, the Amitabh Bachchan - Taapsee Pannu starrer is still worth your ticket. If you love a good old school thriller then Badla is your ticket this weekend. Buckle up for a good roller coaster ride!